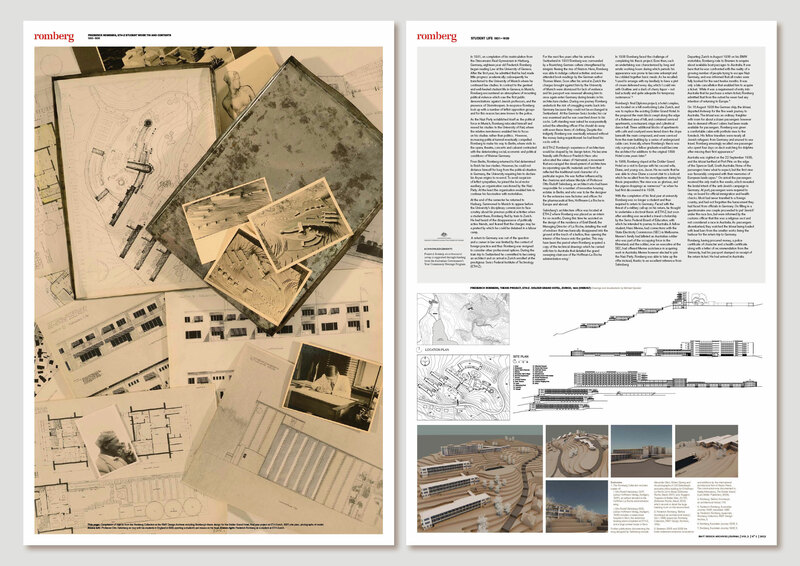 Frederick Romberg: an architecture survey is a collaborative interdisciplinary project that has approached the RMIT Design Archive’s Frederick Romberg Collection with the intention of examining not only his architectural output, but the many ways in which the collection might be seen to work and have implications for contemporary discourse on design. It has sought from the nuances of a collection – the frayed edges, the insistent folds – an active archive. Four pieces from the collection form the focus of the Romberg project: a poignant tin box that contains Romberg’s student portfolio which he brought with him on his journey to Australia from Europe; a presentation photograph album of his early work; a red cloth album documenting a return journey to Europe; and a large green scrapbook that collages the work from Romberg’s career and Cleary exhibits the hand of the architect in its creation. 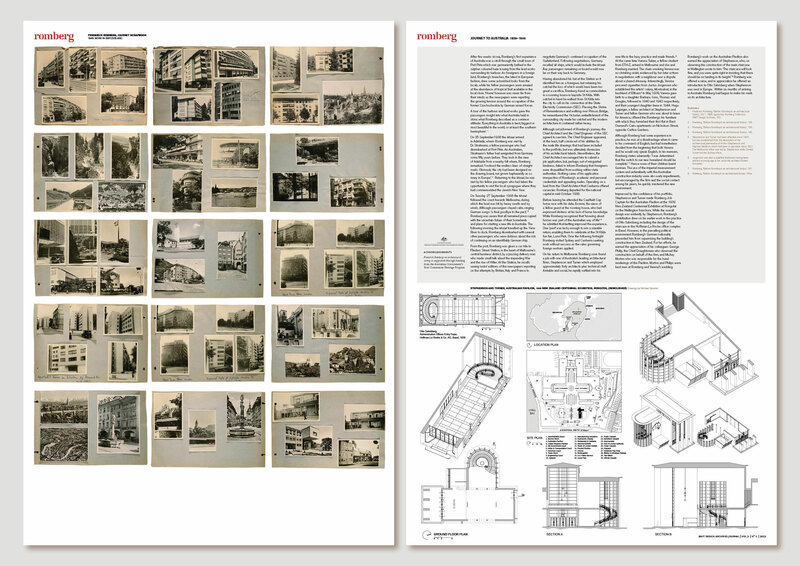 One outcome of the project, a special issue of the RMIT Design Archives journal, is presented as a collection of posters that can be read together or separately. The journal does not draw conclusions; it simply implies that the messy resolve of a life can be brought together on one page. 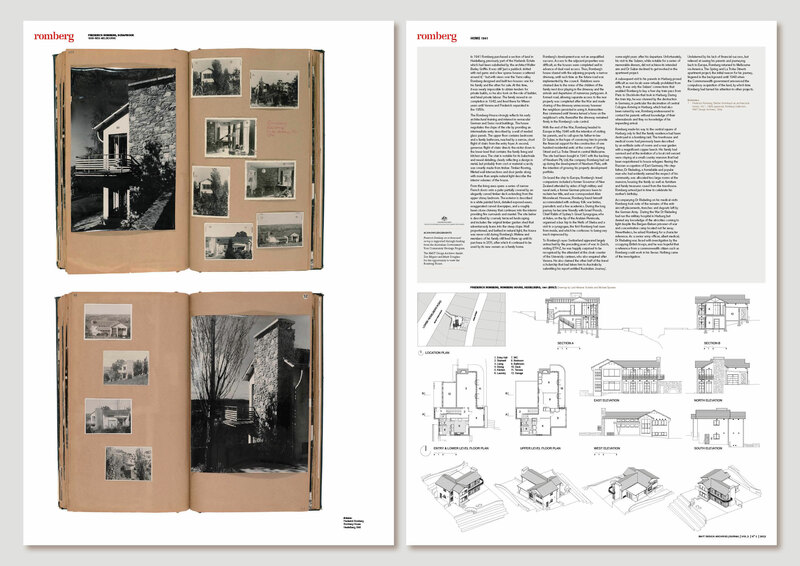 Essays drawn from Romberg’s own account of his life and work and his travel scholarship paper, ‘Australian journey 1938’, address his early life as an architecture student in Zurich, his passage to Australia from Europe, early architectural practice in Melbourne, and, an impression of his home here. 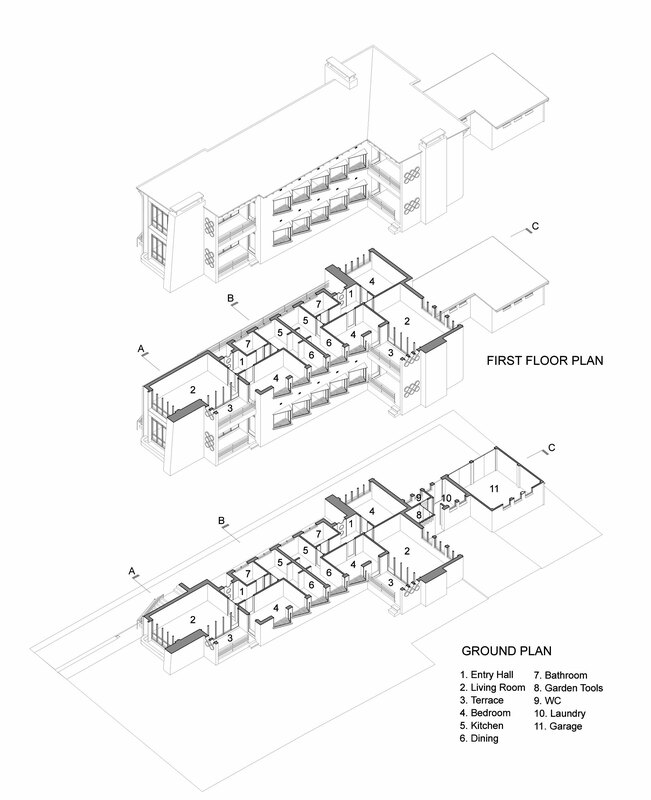 The essays are accompanied by detailed three-dimensional examinations of selected buildings. 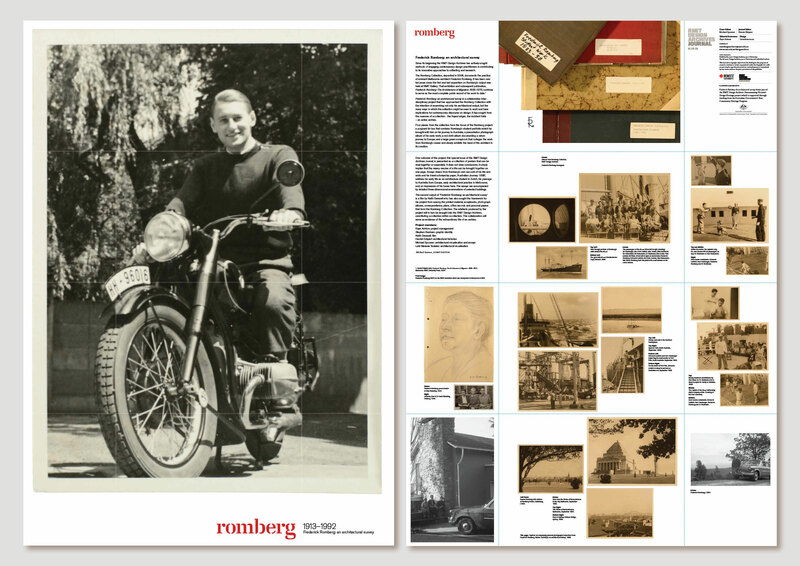 The second output is a film by Keith Deverell who has sought the framework for his project from among the printed material, scrapbooks, photographs albums, correspondence, plans, office records and personal papers that form the Romberg Collection. The artefacts produced by the project will in turn be brought into the RMIT Design Archives, constituting a collection within a collection. 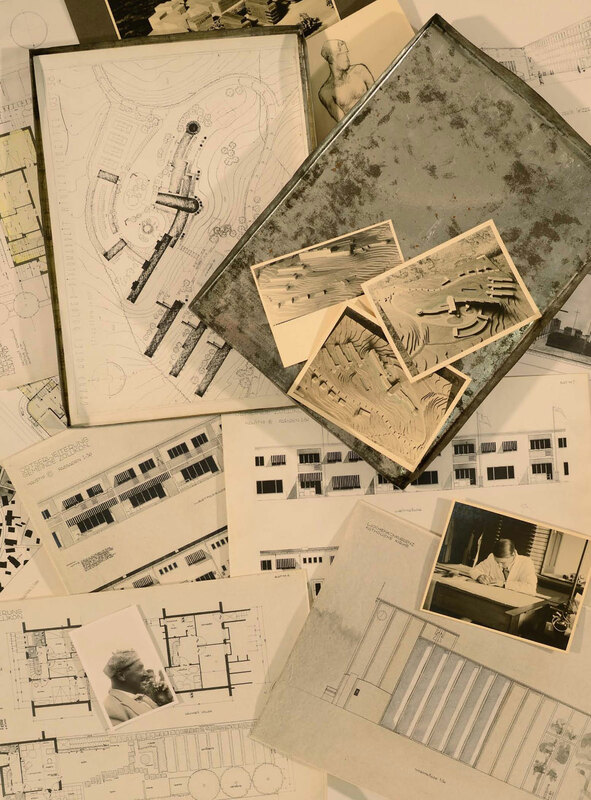 This collaboration will serve as evidence of the extraordinary life of an archive. 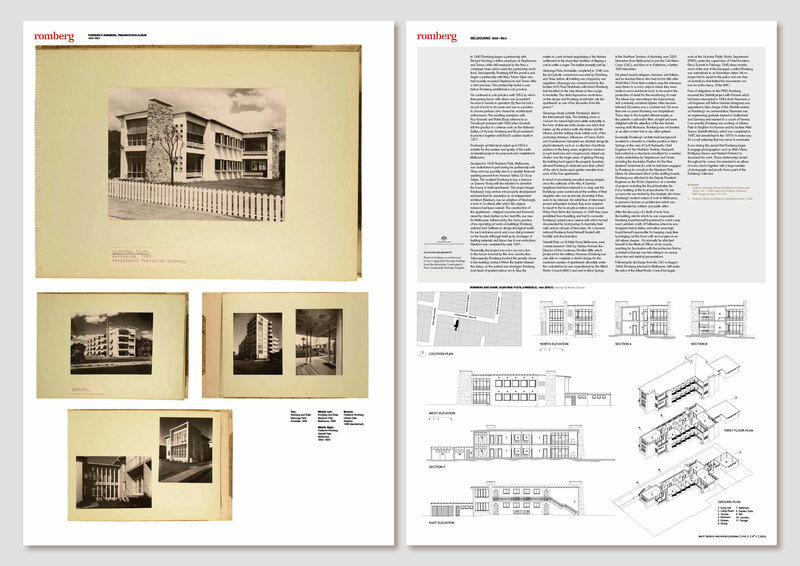 ‘Frederick Romberg: an architectural survey’ forms part of the RMIT Design Archives Disseminating Victoria’s Design heritage project which is supported through funding from the Australian Government’s ‘Your Community Heritage Program’. 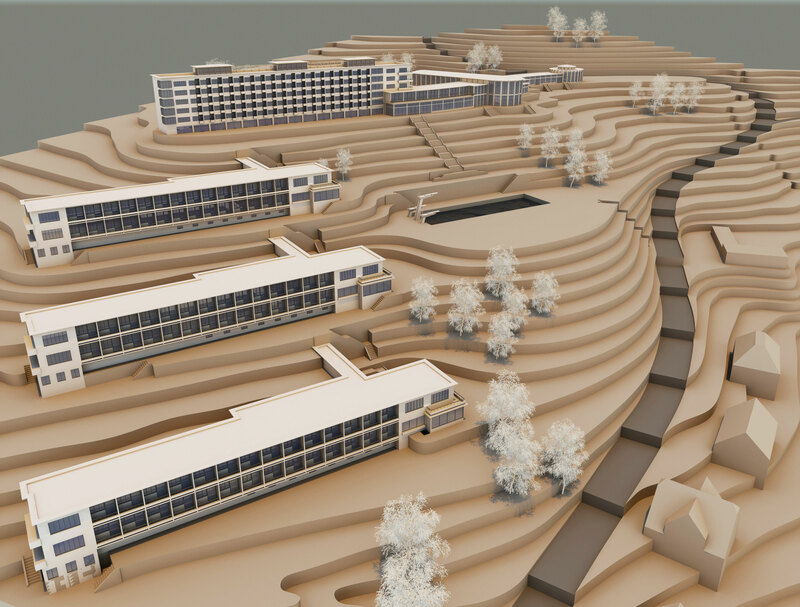 ‘Frederick Romberg: an architectural survey’ was presented during Australian Heritage Week 2013, 13April – 24 May 2013 as public display of models and film, supported by an online exhibition. Frederick Romberg, ETH-Z Student Work Tin and contents. Left: Professor Otto Salvisberg on tour with his students in England 1938, sporting a student’s pet mouse on his head. Right: Frederick ROmberg as a student at ETH-Zurich. Stephenson and Turner, Australian Pavilion, 1939 New Zealand Centennial Exhibition, Rongotai, (demolished). Romberg retained work with the Melbourne office of Stephenson and Turner soon after his arrival in Australia. Impressed by the graduates confidence Romberg was made job captain for the Australian Pavilion. Romberg and Shaw, Glenunga Flats, Armadale, Melbourne, 1940 (built). Drawings by Michael Spooner. 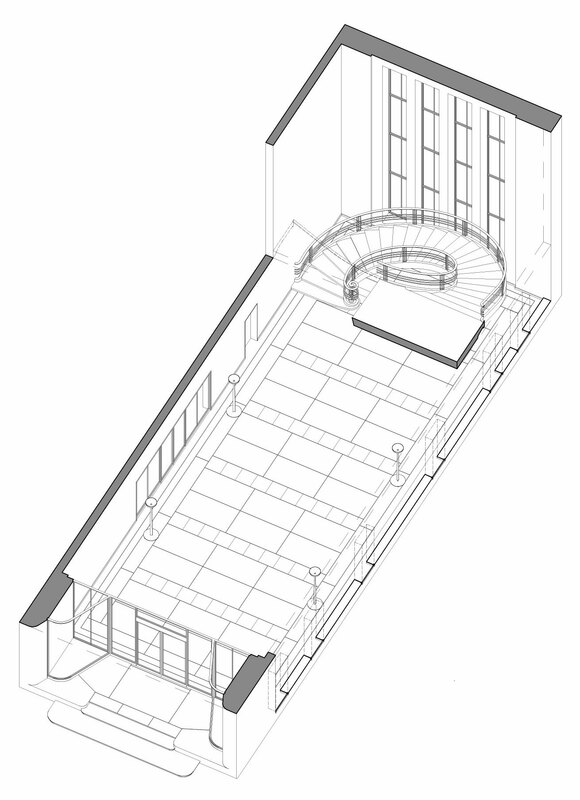 Otto salvisberg, Administration Offices Entry Foyer, Hoffman La Roche & Co. AG, Basel, 1939. Romberg studied under and worked for Salvisberg as a student. 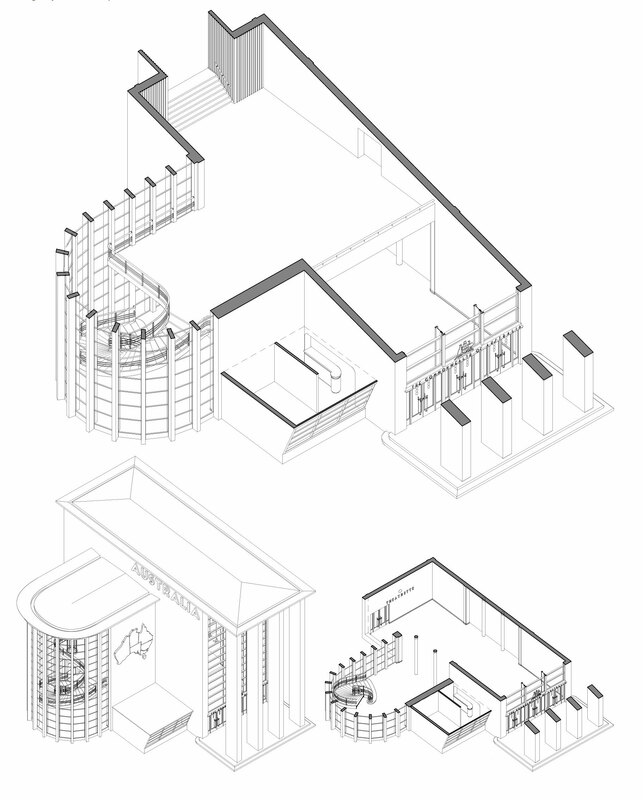 Romberg brought with him to Australia and retained in his files a drawing of these stairs. Frederick ROmberg, Thesis Project, ETH-Z. Dolder Grand hotel, Zurich, 1938 (Unbuilt). Digital visualisation by Michael Spooner.